A few days ago, the inhabitants of two cities in China were transfixed, and the denizens of social media all agog, over a mysterious object which materialised in the sky above Jiangxi and Foshan. It appeared to be a metropolis of towering buildings nestling in the middle of a cloud formation. It brought streets to a standstill for the fleeting few minutes it was visible. Was it a glimpse into a parallel universe? Or was it a secret weapon being tested by a hostile power? Or was it a UFO? But weather experts had an explanation for the unsettling sighting. It was an optical illusion known as a Fata Morgana - a type of mirage which distorts objects from their original appearance, rendering them almost unrecognisable. There was a touch of the Fata Morgana about Sinn Féin yesterday as we had, not one, but two separate security reports on paramilitary activity on both sides of border. The first report by the PSNI/MI5 was most damning, stating that IRA members believe the army council "oversees both PIRA and Sinn Féin with an overarching strategy". The second document from the Garda Siochána was cagier than the lions' enclosure in Dublin Zoo, sticking to its insistence that there is "no evidence" the army council was operational in the Republic, although former PIRA associates are involved in criminality. It was a classic piece of 'nothing to see here, please move along'. 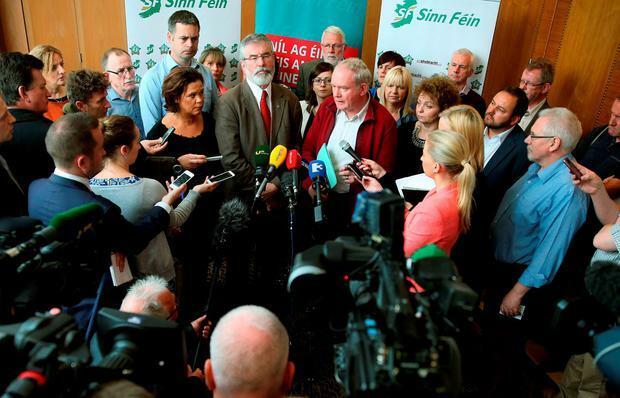 Usually when Sinn Féin is under pressure politically, it launches a counter-attack which is both swift and robust. But this wasn't the case yesterday. It was a tense-looking Gerry Adams who took his seat in the Dáil chambers for Leaders' Questions, surrounded by a phalanx of subdued deputies. Micheál Martin could've gone in with boots flying - after all, he and the Sinn Féin leader have repeatedly tangled bitterly on this issue. But he took an oblique approach, requesting that, as a response to the PSNI report, the Taoiseach consider a "well-resourced" cross-border agency to tackle organised crime. "There's a problem here, Taoiseach, and I think both governments - and particularly here - we took the eye off the ball," charged Micheál. "There's a sense these groups have been allowed act with impunity, there are individuals ruling the roost in these areas on a continuing basis and there is a well-established organised criminal network involving individual members of paramilitary groups," he added. "There's a twilight zone that we can't get at." Enda trod gingerly, unwilling to scare the skittish Stormont horses. "It clearly raises matters of very serious concern, issues about the existence of illegal organisations and command structures, about access to weaponry and about widespread criminality. Now, these things have no place - can have no place - in our democracy," he stated carefully. Did the Sinn Féin leader, or any of his Dáil colleagues, stand and mount a rebuttal of the findings? Nope. Instead Gerry confined himself to a perfunctory swipe at Micheál. He remarked that the North's journey from conflict to peace "is clearly not a task for a hurler on the ditch like the leader of Fianna Fáil," before proceeding to ask the Taoiseach about the halting-site stand-off in Carrickmines. The rest was silence from Sinn Féin's TDs. No clarification offered on the disturbing claims by IRA members of an army council influence on the party. It can be difficult sometimes to discern Sinn Féin's own borders. It's like a mirage - elusive and shapeshifting - leaving disoriented spectators uncertain as to where the party's past and present begins and ends.